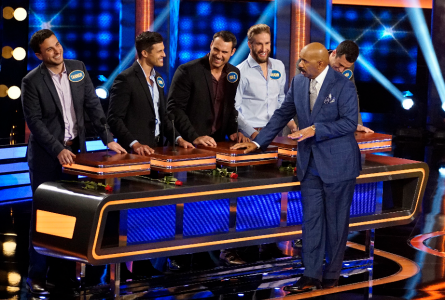 ABC’s match-making franchise “The Bachelor” go head-to-head on “Celebrity Family Feud” in “Bachelors vs. Bachelorettes” featuring fan favorites from both shows. 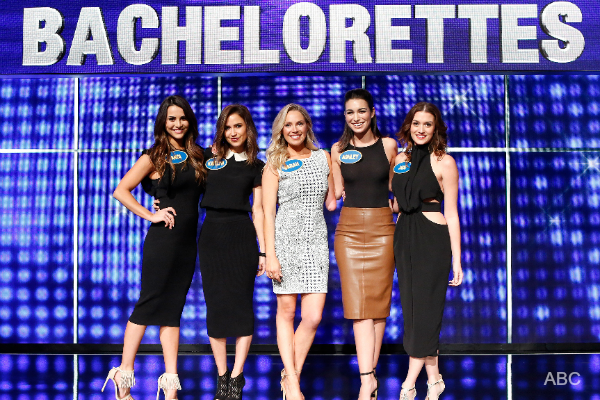 On the Bachelorettes’ side – Kaitlyn Bristowe, Andi Dorfman, Jade Roper, Ashley Iaconetti, and Sarah Herron. And, on the Bachelors side – Ben Higgins, Ben Zorn, Shawn Booth, Tanner Tolbert, and Chris Strandburg. Two real-life couples playing are Shawn Booth and Kaitlyn Bristowe who got engaged from Kaitlyn’s Bachelorette season 11, and Tanner Tolbert and Jade Roper who got married after meeting on “Bachelor in Paradise”. Host of “Celebrity Family Feud” Steve Harvey, called players Kaitlyn and Shawn up to the podium to compete for the most popular answer to this question – “name a children’s game that adults play in the bedroom.” Shawn was quick to hit his button to buzz-in. But, not quick to answer. He looked to his team mates for an answer. Just when the buzzer should have sounded-off to him running out of time, he managed to say “Twister”. Pictured: Steve Harvey with Bachelors. In the next preview, it was Ben Higgins vs. Andi Dorfman. Steve Harvey gave them – “we asked 100 women name something you have that’s large and luscious.” Ben quickly hit his button with “bra!” Andi immediately laughed at his answer thinking what Harvey said. Harvey told Ben “you don’t really mean bra. You’re really talking about what’s IN the bra!” It ended-up being the number one answer on the board under “Glistening Orbes”??? WHAT??? SEE Sneak-Peek Photos From the Episode HERE! They scored a total of 193, but needed 200 points to win the big money. The show gave their charity $10,000 for playing. 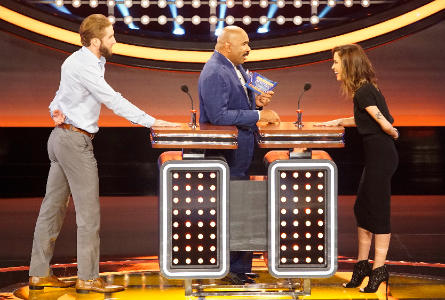 This “Celebrity Family Feud” episode airs on Sunday, July 31 on ABC with also an episode of Indy Car Drivers vs. Sports Illustrated Models.